Voronoi patters are widely used in computer graphics for procedural modelling and shading/texturing. 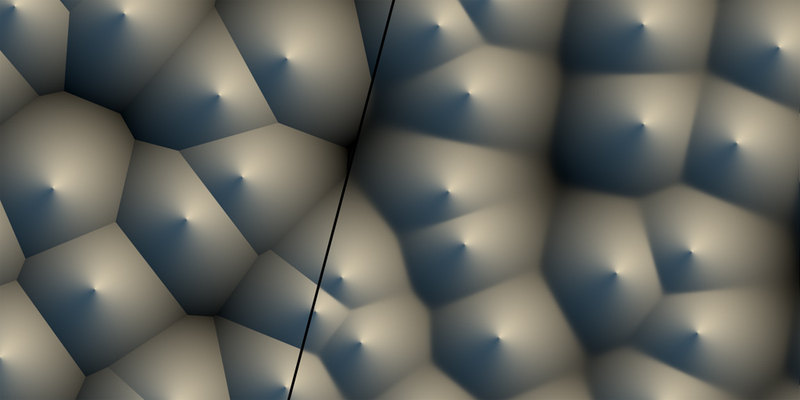 However, when used for shading, one has to be extra carefull because voronoi signal are discontinuous by definition and therefore difficult to filter. That's why normally these patterns are supersampled and baked into textures. There are other reasons to prefer baking over procedural evaluation, like filtering under minification, which is a problem with all procedural signals actually. Yet, i'd like to give the voronoi pattern a second chance as a procedural primitive, just for the sake of playing around. So, lets see if we can fix that ugly discontinuity at its source. As expected, the domain is partitioned in a grid, the cell in which the current shading point x lays is determined, the set of 3x3 cells centered in it is scanned, a random point is generated in side each of these 9 cells, and the distance from x to the closest such point is recorded. So far so good. Before continuing, it might be worth noting that there's a nice trick in this code above. Most implementations out there suffer from precision issues, because they generate their random points in "domain" space (like "world" or "object" space), which can be arbitrarily far from the origin. One can solve the issue moving all the code to higher precision data types, or by being a bit clever. My implementation does not generate the points in "domain" space, but in "cell" space: once the integer and fractional parts of the shading point are extracted and therefore the cell in which we are working identified, all we care about is what happens around this cell, meaning we can drop all the integer part of our coordinates away all together, saving many precision bits. In fact, in a regular voronoi implementation the integer parts of the point coordinates simply cancel out when the random per cell feature points are substracted from the shading point. In the implementation above, we don't even let that cancelation happen, cause we are moving all the computations to "cell" space. This trick also allows one to handle the case where you want to voronoi-shade a whole planet - one could simply replace the input to be double precision, perform the floor() and fract() computations, and go floating point with the rest of the computations without paying the cost of changing the whole implementation to double precision. Of course, same trick applies to Perlin Noise patterns (but i've never seen it implemented nor documented anywhere). Back to our discontinuity issue. The problem with the voronoi pattern is of course the min() operation, that's where the discontinuity is introduced. Therefore, the idea today is to replace that min() operator with something that is similar enough, but continuous. If you think about it, the concept here is that we have a set of 9 points from which we are going to pick only one - the closest. So, what if instead of picking only one point we do actually pick them all but give to the closest one the most relevance, yet not full importance, such that as we move over the domain and new points become closer to our shading point we can smoothly transfer importance from the old closest point to the new one. In other words, what if instead of picking the distance to the closest point, we do a weighted average of the distances to all the points, in a way that it all resembles a min() operation so that we preserve the well known voronoi look. This can be done in many ways of course. For example, one can use the inverse of the distance raised to a big power as a closeness factor, then add them all together and undo the inversion and the power in the end, on the hope that the closest distance will gain over the others in relevance. This works pretty well, but can have precision issues. Another alternative is to use a quickly decaying exponential of the distance. This behaves nicer and provides a very intuitive control for the smoothness of the function, the downside being that it needs one extra square root in the inner loop. To ensure these functions are perfectly and mathematically derivable/smooth one would need to window the distance decaying function with a smoothstep or something. While super easily doable, the strong decay of the exponentials makes it numerically continuous anyway. Depending on the falloff, though, you might want to extend the search neighborhood to a 5x5 grid, perhaps. Lastly, this is the effect on the continuity of the pattern when varying the distance falloff in the exponential smooth voronoi. 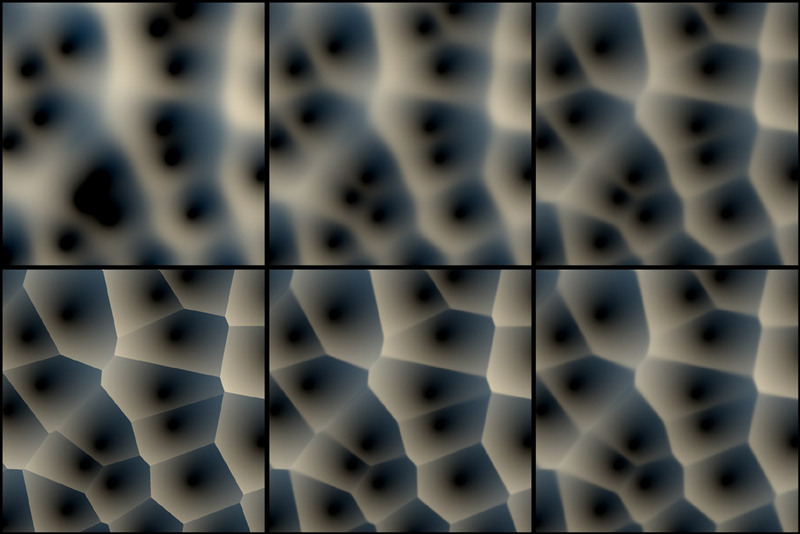 Top left: falloff=4, top center falloff=8, top right falloff=16, bottom right falloff=32, bottom center falloff=64, bottom left classic voronoi for reference.